The Madrid road network radiates from the famous "Kilometro cero" plaque in the Puerta del sol (Door of the sun). Spreading out like a suns rays from its central hub, from Madrid roads spread out to cover the Iberian peninsula in all directions. are normally only two lanes, except for where the highway enters into the city. These are all toll free roads at the begining however tunnels and later parts are toll paying. Coach travel is still a very normal part of Spanish life. Whereas in the UK it is more usual to take the train or in the US to fly Spain still relies heavily on coach services. If you feel up to trying the Madrid road network here is a full list of all national coach and bus companies, stations etc! Eurolines,www.eurolines.com,is the one coach operator to provide a fixed timetable network accross Europe. Madrid is included in this network with conections to Portugal, Marocco and France. From there onward connections are available Europe wide. Easily the cheapest way to get around Europe if you have time to spend. Although not recommended if you are travelling with kids!! Toll roads are a fact of life in Spain. Referred to as "peajes" these charge a set fee depending on vehicle size and distance travelled. Thankfully in and around Madrid these fees are reasonable however in the north of the country, where the roads were built in mountainous terrain, it is a different story. AP Autovia Peaje - The standard toll road in Spain. Used where the road construction costs were above average and a public private partnership was entered into. In all of Madrids roads these do not appear unless you are journeying on to a different city. R Radial These were constructed by the previous government as a means of relieving congestion around the city. 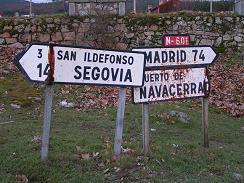 They cover the 1st 40 kms of the journey along the corresponding A road (Autovia) eg: The A-2 runs parrallel to the R-2. By taking these roads you can avoid the worst of the rush hour, weekend or holiday traffic. Generally speaking the R roads are useful on days when there is a lot of traffic or if you are travelling on the friday or sunday of holiday weekends. Outside these times the regular autovia is all you need! Autovias (A) or Nacional (N) roads are the standard two lane (unless entering a city) highways that conect Madrid to the rest of Spain. These are actually one and the same with the inly difference being the old name Nacional being replaced with the new Autovia. Rebranding is not solely the preserve of large corperations! All roads have regular "Gasolineras" (Gas or petrol station)and are quite often accompanied by a restaurant and or Hotel / Motel. Unless you end up in one of the chains of restaurants, you will know immediately by the building exterior, you will be able to eat fresh food at very reasonable prices. There are also regular rest areas all over the Madrid road network for those wishing to take advantage of an opportunity to stretch ones legs.